*In order to create apps on your Twitter account, you need to verify it using a mobile phone number. For that, you can use your own phone number or, if you have a Google account, create one using Google Voice. 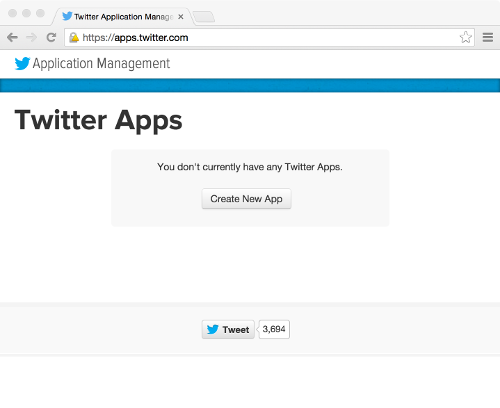 After logging into your Twitter account, proceed to apps.twitter.com. This is where you will register your app, get your API information, and control how your application works. Click on the “Create New App” button to start the process of creating a new app and registering it with Twitter. For each required field, “Name”, “Description” and “Website”, make sure you fill out the information. Note, too, that the “Name” will be how this application is known to other services. While you can using something simple like “TestingBot” for this example, it might be worthwhile to find a name you like and is not already in use for more advanced projects. 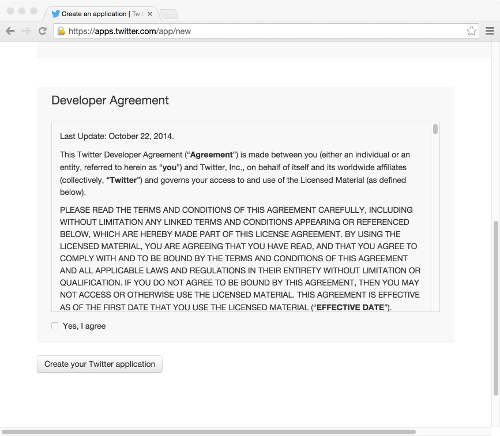 Before you can finalize creating a Twitter application, you must agree to the Developer Agreement. Take the time right now to read through it and become aware of how Twitter expects an application to act and what rights you have as a developer through this agreement. Once done, click on “Create your Twitter application”. 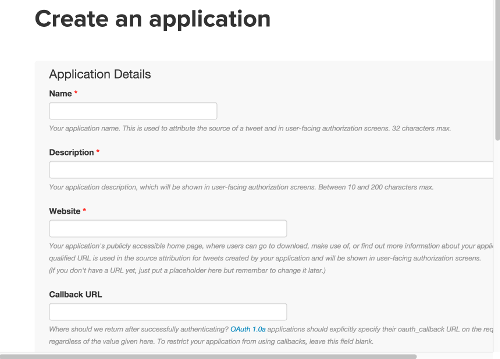 With your application now created, you can change the default permissions from “Read-only” (the application can only read your tweets) to “Read and Write” (the application can read and write tweets). To do that, click on the “Permissions” tab. From the choices, select “Read and Write” and then click on the “Update Settings” button. 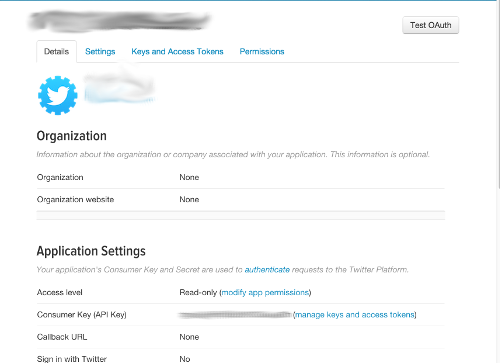 Now that the permissions have been changed and your application will be allowed write tweets in the future, we need to find the API key information and create an access token. Click on the “Keys and Access Tokens” tab. The “Keys and Access Tokens” tab contains your Consumer Key, Consumer Secret, and other private information. As noted in its description, none of those details should ever be public. While Twitter will generate your Consumer Key and Secret pairs for you, it does not automatically create an Access Token for your application. To do that, scroll down the page to find that section. 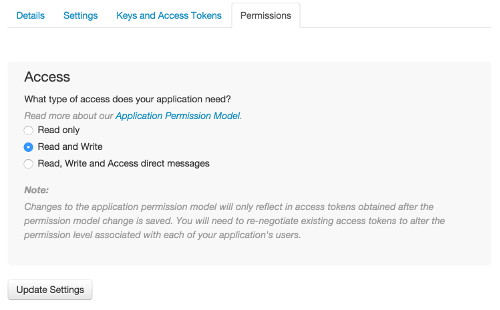 To generate an Access Token at your current permission levels (“Read and Write”) for your application, click on the “Create my access token” button. Once generated, you should now have a Consumer Key, Consumer Secret, Access Token, and Access Token Secret. All four will be needed to use the basic Twitter bot successfully. Open a command-line window and navigate to the folder you created for the project. Once installed successfully, you are now ready to write code and one step closer to having a basic Twitter bot. In the same folder your created moments ago, create a new file called “twitterBot.rb” and copy the following code into it. Within the configuration section of the code, be sure fill in each of the four items it needs: Consumer Key, Consumer Secret, Access Token, and Access Token Secret from your application settings. 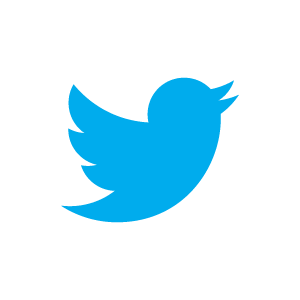 If everything went successfully, you should now have a new tweet in your feed. It should look something like the following, but matching your own Twitter account. Congratulations! You have now created a very basic Twitter bot capable of posting tweets from your Ruby code. Now, obviously, having a single tweet does not a Twitter bot make. It needs something more than the ability to post just a single string of “I’m posting a tweet!” over and over. 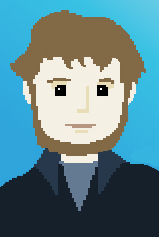 For that, consider looking at the Twitter Ruby gem documentation for details on its API. Really, the sky’s the limit now! Just don’t abuse Twitter’s API. You will be blacklisted for spamming or otherwise breaking their terms of service.